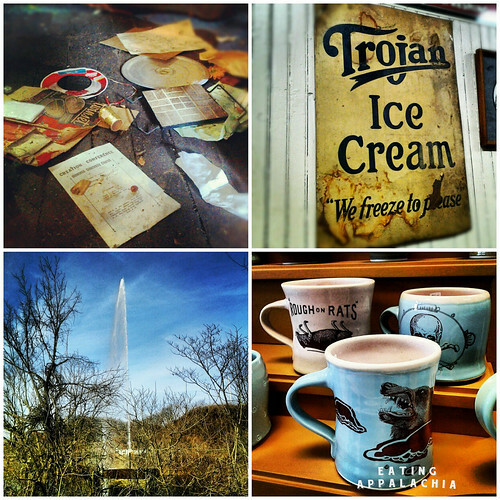 The other weekend, G & I adventured over to Lynchburg (about 50 minutes from our house) to check out some antique stores and see how the downtown revitalization projects were coming along. Add in the glorious spring-like weather and a bite to eat at a local brewery/pizza joint, I don’t think we could have asked for a better day off from renovation & freelance projects. I haven’t spent much time in Lynchburg since my infamous several months dating the photographer (we all make mistakes in our dating histories…), but I figured I could shake off the cobwebs and check out the city without having any traumatic flashbacks. Unfortunately, one of my favorite places in the world to antique at–Lynchburg Estate Specialists–is closing/just closed, so when we were there it was really picked over from a week of 40% off clean-out-the-warehouse sales. The three storey place was packed with junk–some of it amazing back in its heyday, but for us it was just a wander through the leftovers. New favorite find? Most definitely Oxide Pottery. Adjacent to a tattoo parlor, this family-owned, two-generation pottery store sells a great selection of handthrown pottery from mugs to plates to vases to wall art. I was thrilled to pick up that rat mug & I definitely know where I’ll be buying Christmas gifts for the family next year. After browsing antique stores and walking along the river front greenway (with that odd redneck ‘geyser’ fountain in the middle of the river), we stopped by Waterstone Pizza for a some brews and a bite to eat. Waterstone shares a space with the Jefferson Street Brewery, so the beer on tap is almost exclusively locally-brewed by Jefferson. We shared a flight which included the Light, Honey Wheat, American Pale Ale, Dunkel, Oatmeal Stout, and their ‘guest beer’ (one of Blue Mountain’s), and we both felt that the Dunkel and the Honey Wheat were the standout brews. The Honey Wheat is light with a hint of honey, perfect for a summer day, and the Dunkle held some rich, malty notes that felt perfect for midwinter. While not an exceptional brewery, Jefferson Street offers some good options for those looking for local flavor. The downside? Waterstone charged $10 for a flight. But pints only cost somewhere around $4. Someone explain to me how 6 tastes equalling maybe 24 oz at best is worth more than twice as much as two pints (equalling 32 oz). Something’s off there. So stick with a pint if you go there instead of a flight. 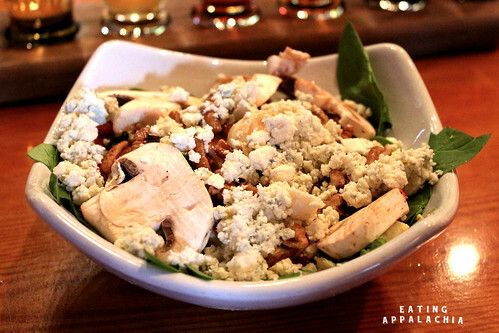 After ordering the beer, we split a small spinach salad served with a bacon vinaigrette, mushrooms, roasted red pepper, and gorgonzola. Hello overly large sprinkling of cheese. The salad could have been stellar if the cooks had simply cut the mushrooms to bite-sized pieces (giant raw mushroom chunks aren’t particularly appetizing) and dressed the salad a little less. The poor spinach was drowning in vinaigrette. Which, don’t get me wrong, the bacon vinaigrette was nicely balanced (and who doesn’t like bacon), but it was a little overdone. Same with the cheese. It felt like a cheese salad with a bit of spinach. Not horrible, but not very good either. As for the pizza? You know, I can’t remember exactly what it was like 2 years ago when I ate here with the photographer, but I swear the pizza wasn’t a crackery, thin crust. I remembered a thicker dough, but maybe it was always this recipe, who knows. G & I split the Federal Hill–a traditional red sauce pizza with roasted red peppers, mushrooms, pepperoni, and mozzarella–and, again, while it wasn’t horrible, it wasn’t memorable either. I’m not a big fan of thin crust pizza, but if they are cooked properly, then they can win me over. This one, however, was obviously not cooked at a high enough temperature to fully cook the bottom and was soggy with a pale, uncharred bottom. 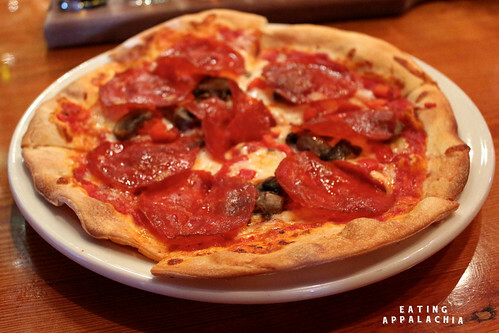 The toppings were fine–the mushrooms well cooked, the pepperoni with a good spicy bite, the sauce nicely balanced between sweet and acidic, but, when considering the whole pie, it just seemed pedestrian and uninspiring. Not what I want out of a $10 pizza. My advice? If you’re looking to eat in Lynchburg, I’d suggest somewhere else. The space at Waterstone is comfortable and modern (an open loft plan) and the beer is decent, but the food leaves something to be desired. The antique stores though? Totally worth a visit. And if you’re looking for fantastic, curated mid-century modern furniture and art, be sure to stop by Galaxie Modern. Tell them I sent you and be sure to give Winston (the Boston Terrier) a pat on the head! Hm, too bad about the dining experience but it sounds and looks like a pretty cute town. 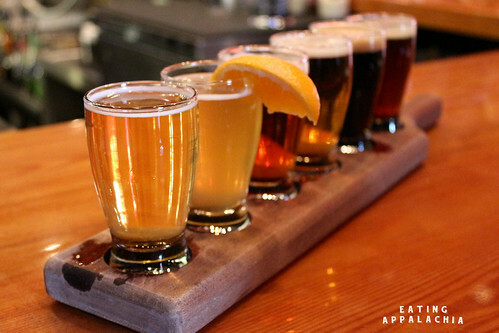 I love beer flights! There aren’t too many places I know of around here that offer them but they’re fun…at the right price, that is. Thanks for this review on Lynchburg; I travel through on my way to Amelia/Richmond area and it’s always nice to have a place to stop that isn’t fast food. As to lacking restaurants, try the region where I live…it’s a wasteland compared to Waterstone Pizza. Thistle Cove Farm is gorgeous! What part of the state are you in?